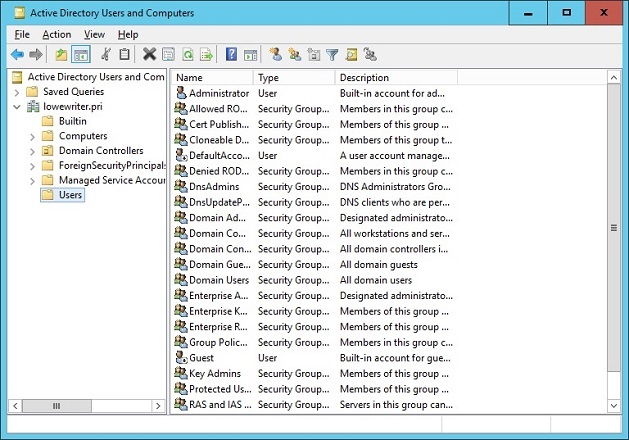 1Choose Start→ Administrative Tools → Active Directory Users and Computers. 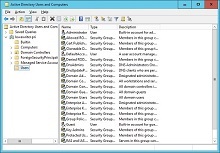 This command fires up the Active Directory Users and Computers management console. 2Right-click the domain that you want to add the user to and then choose New →User from the contextual menu. This command summons the New Object – User Wizard. 3Enter the user’s first name, middle initial, and last name. As you fill in these fields, the New Object Wizard automatically fills in the Full Name field. 4Change the Full Name field if you want it to appear different from what the wizard proposes. 5Enter the user logon name. 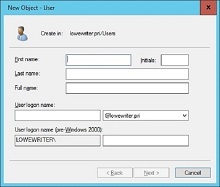 Pick a naming scheme to follow when creating user logon names. You can use the first letter of the first name followed by the complete last name, the complete first name followed by the first letter of the last name, or any other scheme that suits your fancy. 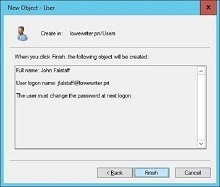 The second page of the New Object – User Wizard appears. You’re asked to enter the password and then confirm it, so type it correctly. If you don’t enter it identically in both boxes, you’re asked to correct your mistake. 8Specify the password options that you want to apply. You’re taken to the final page of the New Object – User Wizard. 10Verify that the information is correct and then click Finish to create the account. If the account information isn’t correct, click the Back button, and correct the error. You’re done! Now you can customize the user’s account settings. At minimum, you’ll probably want to add the user to one or more groups. You may also want to add contact information for the user or set up other account options. An alternative way to create a new user is simply to copy an existing user. 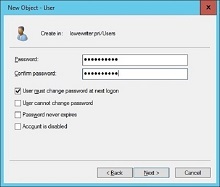 When you copy an existing user, you provide a new username and password and Windows copies all the other property settings from the existing user to the new user.